About 10 years ago, I began tracking reports of soft tissue discoveries in fossils. By 2013, I had compiled a list of around 40 secular technical journal articles that describe either literal soft tissues or tissue remnants that include protein fragments and original biochemistry in very old fossils.1 Real Science Radio host Bob Enyart and I continue to curate that growing list online.2 In November 2018, it surpassed 101 journal articles. We think of this list as “101 reasons to reconsider deep time.” Each article reinforces a dilemma that a recent paper published in the online journal Nature Communications (NComms)3 claims to resolve—why are the tissues still there when artificial decay experiments show tissues can last thousands of years but not millions? Yale News reporting on the NComms study compared the newly described preservation model to the color changes that happen when toast burns.4 So, we’ll call this new explanation the toast model. Do the authors’ published details support their claim that toasted proteins somehow resist microbes and molecules for millions of years? We offer two merits and five refutations of this claim. The refutations leave original tissue fossils just as mystifying to secular thinking as ever. The toast model study authors summarized the core issue: “The maximum longevity of original proteinaceous matter in vertebrate hard tissues has been estimated at 3.8 million years, although molecular remnants have been reported from older rocks.”3 The best protein decay estimates derive from artificial experiment decay curves that indicate best-case scenarios for protein survival.5 The NComms authors justified their 3.8 million-year (My) figure with studies that did not rely wholly on decay experiments. Dr. Kevin Anderson of the Creation Research Society and I replicated similar decay studies. Our initial, unpublished results suggest that even 500,000 hypothetical years would stretch credulity for the decay of porcine bone collagen under an assumed historical temperature of 10°C (50°F). These studies do not include microbial degradation or radiation exposure, both of which damage large, complicated molecules. In the end, any of these numbers challenge deep time. After all, original biochemicals occur in fossils that bear age assignments two orders of magnitude older than even 3.8 My. The fossil tissues’ shelf life cannot reasonably extend this far, let alone many times beyond it, so secularists look elsewhere for ways to shield their belief in deep time from the data that challenge it. Table 1. Devices that were proposed to rescue original biochemicals in fossils from millions of years of decay. 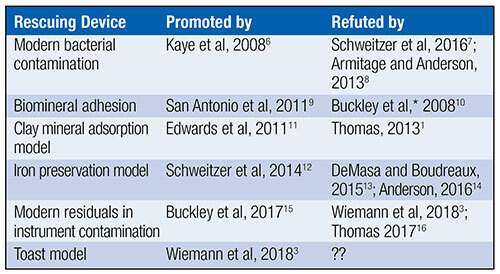 *Buckley et al indirectly refuted biomineral adhesion before its publication in 2011 by having already measured the bone collagen decay rate with biomineral adhesion included. Uniformitarians have offered at least five scenarios in efforts to rescue fossil proteins from millions of years’ worth of chemical reactions that should have obliterated all original biochemistry. Table 1 outlines this history. 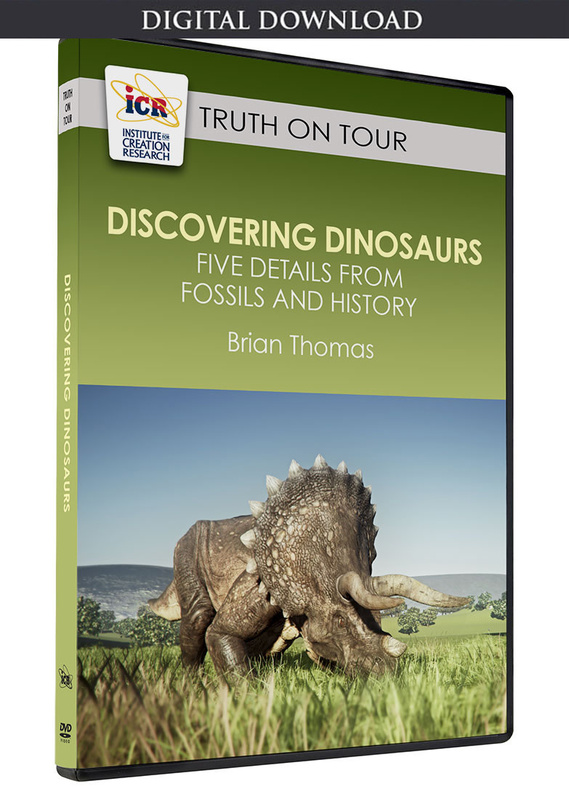 Peer-reviewed articles from either secular or creation science have refuted all five main attempts to explain soft tissue or original biochemistry in dinosaur and other fossils. Will the toast model be the first to escape incineration from the heat of scientific scrutiny? Below, I suggest five reasons why the toast model will prove to be the sixth failed rescuing device for original biochemistry in fossils. What Is the Toast Model? Figure 1. Partly polymerized soft tissues from demineralized Diplodocus, Allosaurus, and Apatosaurus bone. Images show remnants of osteocytes (oc), osteocyte lacunae (ocl), a blood vessel (bv), extracellular matrix (ecm), and basal lamina (bslm). Image credit: Adapted from Wiemann et al., Nature Communications. Used in accordance with federal copyright (fair use doctrine) law. Usage by ICR does not imply endorsement of copyright holders. 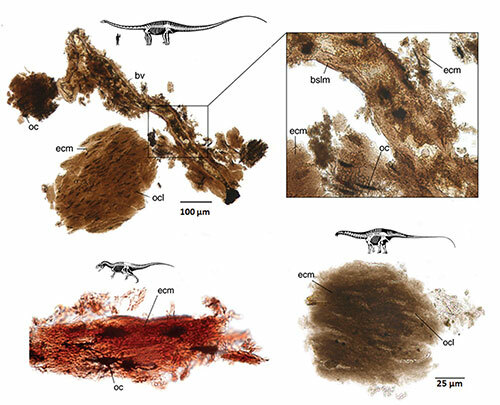 The NComms team noted dark coloration in or near soft tissues they found in their selected dinosaur bones and other fossils, as shown in Figure 1. Toasting bits of modern bone and shell on a hot plate for no more than 60 minutes darkened those proteins, too. The researchers found similarities in Raman spectra between toasted modern samples versus bone, shell, and tooth or scale tissues from fossils. Raman spectroscopy detects chemical bonds that help identify the chemistry of a sample. The NComms study authors noted that proteins crosslink in both real fossils and artificial fossils (the toasted hard-tissue samples). They then asserted that fossilization “toasts” biochemicals into resistant compounds. Crosslinking refers to reactions that form covalent bonds between peptides and/or lipids. It happens daily inside cells to make a class of chemicals called N-heterocyclic polymers. The polymers have various sizes and configurations. They include Advanced Glycoxidation Endproducts (AGEs) and Advanced Lipoxidation Endproducts (ALEs). Healthy cells can take out this trash. After cell death, these polymers can accumulate—especially if heated. N-heterocyclic polymers are relatively large molecules that may last longer than the more fragile proteins from which they arose. They assume that N-heterocyclic polymers last millions of years. They further assert that the polymers shield nearby proteins for millions of years, too. No doubt, some uniformitarians will latch onto this idea as the explanation for what was once an anomaly but is now merely an “apparent anomaly.” Do data securely support this position? 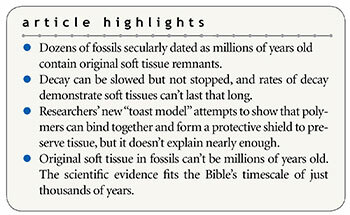 Another merit of the toast model is that it recognizes and explains why certain fossils’ soft tissues look darker than others. Oxidation during fossilization (probably very early in the process) can turn proteins into non-proteins. Similarly, it explains the change in Raman spectra between fossil and modern bone. A few years ago, I obtained Raman spectra from ancient bones (both thin-sectioned and powderized) of a range of ages (data unpublished). I noticed spectral differences between modern and ancient dinosaur bone that the toast model helps explain. Despite these commendations, problems arise with the idea that polymers can shield proteins for millions of years. 1. What about the light, not dark, soft tissue fossils? Figure 2. In the image above, (b) shows an interconnecting network of transparent vessels taken from a T. rex bone sample, while (g) shows transparent Triceratops blood vessels. Image credit: Copyright © 2006 The Royal Society. Used in accordance with federal copyright (fair use doctrine) law. Usage by ICR does not imply endorsement of copyright holders. In 2016, researchers described glycine, alanine, proline, leucine, lysine, hydroxyproline, and hydroxylysine in blood vessels from inside Mesozoic bones from Poland. They used other methods to detect histidine, asparagine, and either cysteine or cystine.18 More time equals more opportunity for crosslinking, toasting, and darkening. After 247 million years, why haven’t all these residues oxidized into darkened decay products, including N-heterocyclic polymers, and why haven’t those decay products themselves turned to dust? How does the toast model explain the obviously white T. rex connective tissues published in 2005 in Science19 or the transparent T. rex bone cells and Triceratops blood vessels published in 2007 in Proceedings of the Royal Society B (Figure 2)?20 It explains nothing about these totally untoasted soft dinosaur tissues. For the sake of argument, let’s assume polymer shields protect nearby proteins from “microbial digestion” for millions of years. Even so, no objective evidence supports the contention that such imagined shields could also protect nearby proteins from hydrolysis, a chemical breakdown due to reactions with water molecules. Chemistry happens relentlessly. Even a polymer shield strong enough to resist microbes would soon develop cracks. It cannot block chemicals like oxygen, which also readily reacts with fragile molecules even underground. Indeed, tougher man-made polymers begin to break down within one human lifetime, so why should anyone believe that relatively flimsy AGEs can last even one million years? Microbes are only part of the problem. One can imagine ways to keep germs at bay for a while, although even they consume polymers,21 but how can oxygen be kept away? Geochemistry knows no way. So, should we attribute the crosslinking to increased temperature, chemical conditions, early diagenetic processes, late diagenetic processes, or what? If the toast model works, then older samples should look darker than younger ones—the opposite of this result. It’s one thing to make a claim but another to defend it. Color and Raman spectral changes indicate chemical changes in fossil bone proteins. Proteins can crosslink to become resistant polymers. However, what data support the story that these polymers “shield adjacent peptides…through deep time,”3 or even that microbes don’t consume them? The researchers reason that molecular shields preserve nearby proteins for millions of years because the protein-bearing fossils are millions of years old. That’s circular reasoning, not good science. Can experiments test the longevity of these toasted-protein polymer shields rather than having to resort to assuming the conclusion? Yes, but the NComms paper shows no such experiment. It offers data for crosslinking but not for molecular shielding—and certainly not for molecular shielding that could last millions of years. The toast model calls for oxidation to crosslink peptides into polymers. However, oxidation breaks down biomolecules, including peptides, more often than it might build them into larger structures.14 A proper decay experiment would undoubtedly confirm the oxidative decay of polymers.22 Then the polymer shield would be toast. Figure 3. Thescelosaurus (GDFM07.003, Glendive Dinosaur and Fossil Museum) vertebral flexible connective tissue remnants show almost no sign of hardening due to oxidative crosslinking. Last, the toast model does not explain flexible tissue. It has most of the original proteins crosslinking into a crusty shrink-wrap around protein remnants. How does that explain wholly soft, pliable tissue? For example, North Carolina State University paleontologist Dr. Mary Schweitzer recorded a video of T. rex connective tissue being pulled and stretched and flexing back into shape.23 Similarly, Figure 3 shows a still image from the DVD Echoes of the Jurassic.24 In it, a worker’s forceps pull pliable connective tissue from inside an untreated Thescelosaurus vertebra from Cretaceous system sediments. Mark Armitage and Kevin Anderson published their description of a pliable sheet of soft tissue extracted from a Triceratops horn core excavated from near the surface of the ground.9 And yet, secular dating asserts an age for the horn sediments at about 70 My. 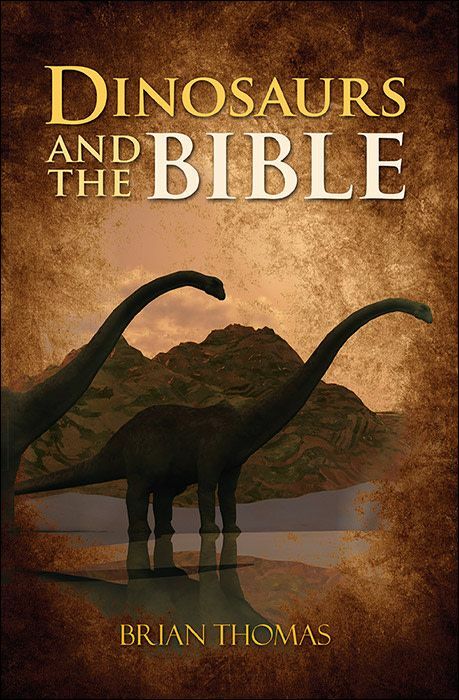 The scientific evidence fits the Bible's timescale of just thousands of years. Does the toast model explain how soft tissue can last millions of years? AGEs and the like may help shield some nearby protein remnants from the ravages of radiation, microbes, and relentless destructive chemistry for thousands of years. But it explains none of the features of entirely flexible, not-toasted tissue structures found in other fossils. The way to show that AGEs last for millions of years is to perform a longevity experiment. Nobody has done that. As a result, the only way to conclude that the toast model explains protein persistence for millions of years is to first assume that fossils with proteins still in them have been sitting in the ground for millions of years, thus begging the question. For these reasons, we predict that the toast model will help explain certain fossil features but that other soft tissue discoveries will continue to fail to fit the toast model’s mold. The most practical explanation for all fossil protein persistence still lies in contracting the evolutionary timescale down to a biblical timescale. Noah’s recent Flood explains the persistence of organics, including whole tissues, in fossils simply by erasing the uniformitarian requirement of deep time. With the mere several thousand years of biblical history and the Noahic Flood to explain the existence of so many fossils in the first place, original proteins in fossils fall into place. List of Biomaterial Fossil Papers (maintained). Online document, accessed November 20, 2018. Wiemann, J. et al. 2018. Fossilization transforms vertebrate hard tissue proteins into N-heterocyclic polymers. Nature Communications. 9: 4741. Shelton, J. A toast to the proteins in dinosaur bones. Yale News. Posted on news.yale.edu November 9, 2018, accessed November 14, 2018. Buckley, M. and M. J. Collins. 2011. Collagen survival and its use for species identification in Holocene-lower Pleistocene bone fragments from British archaeological and paleontological sites. Antiqua. 1 (1): e1. Kaye, T. G., G. Gaugler, and Z. Sawlowicz. 2008. 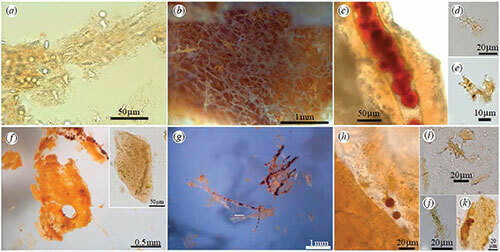 Dinosaurian Soft Tissues Interpreted as Bacterial Biofilms. PLoS ONE. 3 (7): e2808. Schweitzer, M. H., A. E. Moyer, and W. Zheng. 2016. Testing the Hypothesis of Biofilm as a Source for Soft Tissue and Cell-Like Structures Preserved in Dinosaur Bone. PLoS ONE. 11 (2): e0150238. Armitage, M. H. and K. L. Anderson. 2013. Soft sheets of fibrillar bone from a fossil of the supraorbital horn of the dinosaur Triceratops horridus. Acta Histochemica. 115 (6): 603-608. Buckley, M. et al. 2008. Comment on “Protein Sequences from Mastodon and Tyrannosaurus rex Revealed by Mass Spectrometry.” Science. 319 (5859): 33c. Edwards, N. P. et al. 2011. Infrared mapping resolves soft tissue preservation in 50 million year-old reptile skin. Proceedings of the Royal Society B. 278 (1722): 3209-3218. Schweitzer, M. H. et al. 2014. A role for iron and oxygen chemistry in preserving soft tissues, cells and molecules from deep time. Proceedings of the Royal Society B. 281 (1775): 20132741. DeMasa, J. M. and E. Boudreaux. 2015. Dinosaur Peptide Preservation and Degradation. Creation Research Society Quarterly. 51 (4): 268-285. Anderson, K. 2016 Dinosaur Tissue: A Biochemical Challenge to the Evolutionary Timescale. Answers in Depth. Posted on answersingenesis.org October 20, 2016, accessed November 21, 2018. Buckley, M. et al. 2017. A fossil protein chimera; difficulties in discriminating dinosaur peptide sequences from modern cross-contamination. Proceedings of the Royal Society B. 284 (1855): 21470544. Thomas, B. Ancient Animal Biochemicals Again. Creation Science Update. Posted on ICR.org December 7, 2017, accessed November 10, 2018. They go “uphill” with respect to longevity while going “downhill” with respect to organization. Surmik, D. et al. 2016. Spectroscopic Studies on Organic Matter from Triassic Reptile Bones, Upper Silesia, Poland. PLoS ONE. 11 (3): e0151143. Schweitzer, M. H., J. L. Wittmeyer, and J. R. Horner. 2007. Soft tissue and cellular preservation in vertebrate skeletal elements from the Cretaceous to the present. Proceedings of the Royal Society B. 274 (1604): 183-197. Kijchavengkul, T. and R. Auras. 2008. Compostability of polymers. Polymer International. 57 (6): 793-804.
van Dijkhuizen-Radersma, R. et al. 2014. Chapter 7.4 in Tissue Engineering. C. Van Blitterswijk and J. de Boer, eds. Boston: Elsevier, 193-221. B-Rex. 60 Minutes. Aired on CBS November 15, 2009. Posted on youtube.com December 26, 2010. Bendewald, J. 2017. 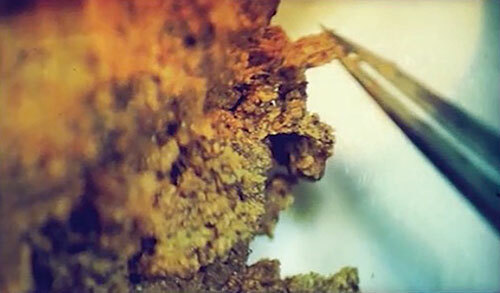 Echoes of the Jurassic: Discoveries of Dinosaur Soft Tissue. DVD. Creation Research Society. Cite this article: Brian Thomas, Ph.D. 2019. Does the Toast Model Explain Fossil Protein Persistence?. Acts & Facts. 48 (3).